Winchester Jerky is a licensed product distributed by Bric-A-Brac, Inc., out of Las Vegas, NV. The name "Winchester" is meant to be the same name as the brand of gun. This package of jerky uses the same trademarks and images of the famous rifle that "won the west". The Olin Corporation, which owns Winchester, licenses its brand out to several consumer product manufacturers for a wide array of stuff. Winchester Jerky is not typically found in the United States, with the exception of asian food stores found in various asian communities. Rather, it's largely sold overseas in Japan, and in airports around the world where asian travellers tend to make stops. Bric-A-Brac knows that the Japanese have a love affair with America's "old west", and beef jerky has gained cult following there as a snack, and thus a product named after the rifle that became synonymous with the old west is a way to boost marketability. This jerky is actually manufactured by Monogram Meat Snacks, LLC, the same company behind the Jeff Foxworthy Jerky, Trails Best Jerky, and the NASCAR branded hot dogs and meats. Winchester Jerky includes several varieties of beef jerky and ham jerky. 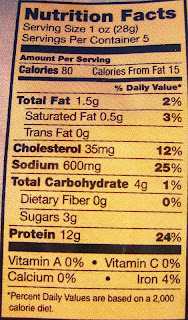 Pork (ham), brown sugar, water, contains 2% or less of the following: salt, spices, hydrolized soy protein, dextrose, soy sauce, hydrolized soy and corn protein, autolyzed yeast extract, sugar, maltodextrin, flavoring, natural flavors, sodium nitrite. There's a sweet initial taste upon putting a piece into my mouth, and that sweetness morphs into a "ham" taste. The saltiness comes on pretty strong, along with its associated soy sauce flavoring, and then I can feel the "tingle" of spiciness in the back of my mouth. As I start the chewing, I can taste more of the ham flavor. The ham flavors in this are pronounced, though I can't say it's a strong ham taste. Most of the ham taste comes from the surface of these pieces, perhaps in the sugar. I can continue getting that ham taste during the chew, but it's not a strong one. I'd say that the "spicy" advertisement on the package is warranted, because I do sense some spiciness in this. I'd rate it as mild-medium, or maybe just medium at best. I can taste the chili pepper seasoning in this, and I get it even more when I bite into a chili pepper seed. The soy sauce flavor that I described above only seems to be detectable when I let a piece soak in my mouth for several seconds, and then I extract the juices. It tastes more like the chinese style soy sauce rather than the japanese. The saltiness is heavy. It wears me out after pieces, and detracts from this jerky's snackability. 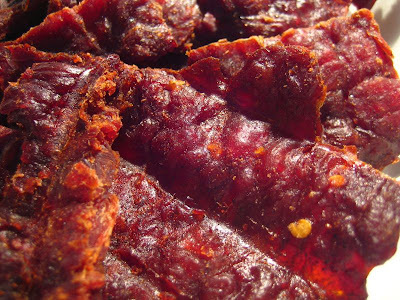 Overall, this spicy ham jerky is very flavorful, with plenty of taste throughout the chew. The flavors that dominate this is the saltiness, the medium-level spiciness, soy sauce, and ham flavors. The sweetness is only dominant in the first few seconds. 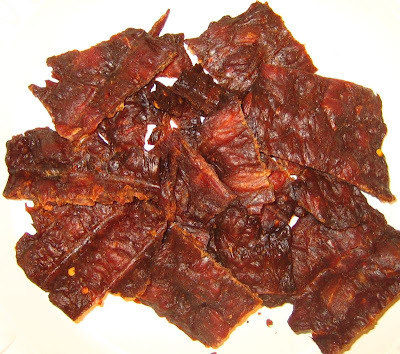 This is a chopped & formed jerky, with medium to thick thickness, and in small to medium sized pieces. The pieces are dry, and are somewhat on the tough side. They tear apart with some ease, perhaps due to the chopped & formed consistency, but require some effort in chewing. It's better to eat this slowly, allowing the pieces to soften up in your mouth. I don't find any tiny bits of "hard stuff", like bone or cartilage in this jerky, considering it's chopped & formed, and nor does it have an oily texture which many such jerkies have. Overall, this has a good meat consistency, if it was easier to chew, I might call it a great consistency. I paid $6.99 for this 5oz bag at a Mitsuwa Market in San Diego, CA. That works out to a price of $1.40 per ounce, making this average priced. For general purpose jerky snacking, I'd say that this offers a good value. You're getting a jerky with lots of flavor that lasts throughout the chew, with a good meat consistency, and decent amount of snackability. The high level of saltiness, for my own purposes, make it hard for me to snack on. But perhaps it's ok for others. As a "spicy ham" variety, I'd say it also offers a great value. It tastes exactly that, offering a noticeable ham flavor that has been spiced up with a noticeable chili pepper seasoning. This spicy ham variety from Winchester Jerky offers a sweet ham flavor with a medium-level chili pepper seasoning in a good meat consistency. It's largely the heavy salt flavor that prevents me from giving this a higher rating, with it's tough chewing to back that up. Otherwise, I actually like the flavor of this, with the ham, the sweetness, and the chili pepper seasoning. Just tone down the saltiness please! As for those Japanese business travellers, who find this package of jerky at an airport terminal shop, go ahead and pick it up. It'll make a great snack on your trip over the Pacific. As you look out the window at 30,000 feet, you'll imagine how the gun-slingers back in the old west used to grind up pieces of leftover ham, marinate them in soy sauce and hydrolized corn proteins, and form them into pieces that look like meat. The Maple Ham Jerky is the best jerky I have ever tasted. I had never tried ham jerky before but once I tried the Maple Ham flavor I was instantly hooked. You ought to try Remington's jerky line. Its like steak. I don't know which company makes a better gun, but Remington by far has the best jerky.